Vitesse is formed in 1975 by Herman van Boeyen, Herman Brood, Rob ten Bokum and Peter Smid. A year later, the band has already had several personnel changes and they release a debut album. When this album is not successful, Herman Brood leaves the band to go solo. It takes several albums and singles to finally have some success in the Netherlands. 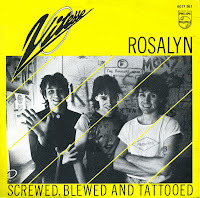 In September 1982 they have their first top 10 hit with 'Rosalyn', which peaks at number 9.